DIY Nesquick Chocolate Milk Powder Mix – Super simple and cheap to make. Made with just 3 ingredients you probably already have. Big thanks to Sugar Bananas for an awesome recipe – check them out!!! 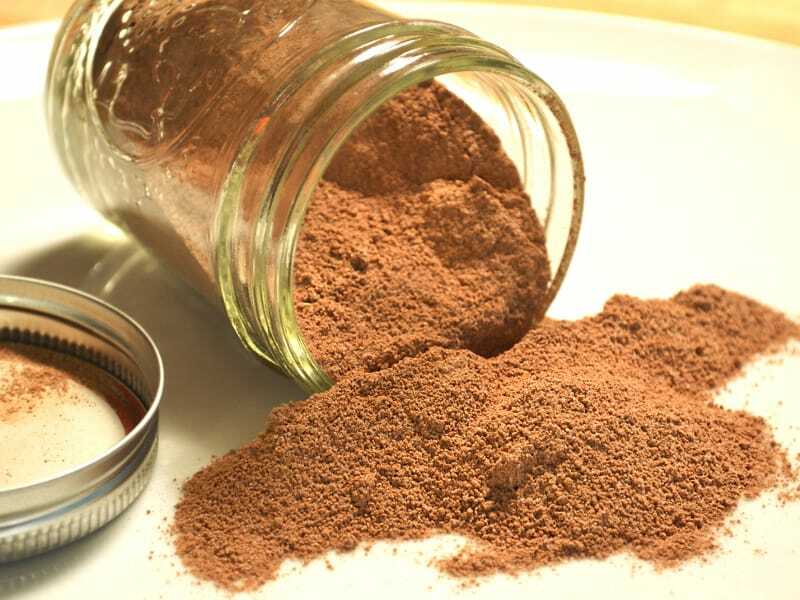 DIY Nesquick Chocolate Milk Powder Mix - Super simple and cheap to make. Made with just 3 ingredients you probably already have. Yay - no additives! Combine all ingredients. I threw all 3 in a mini food processor and mixed for a minute or two. 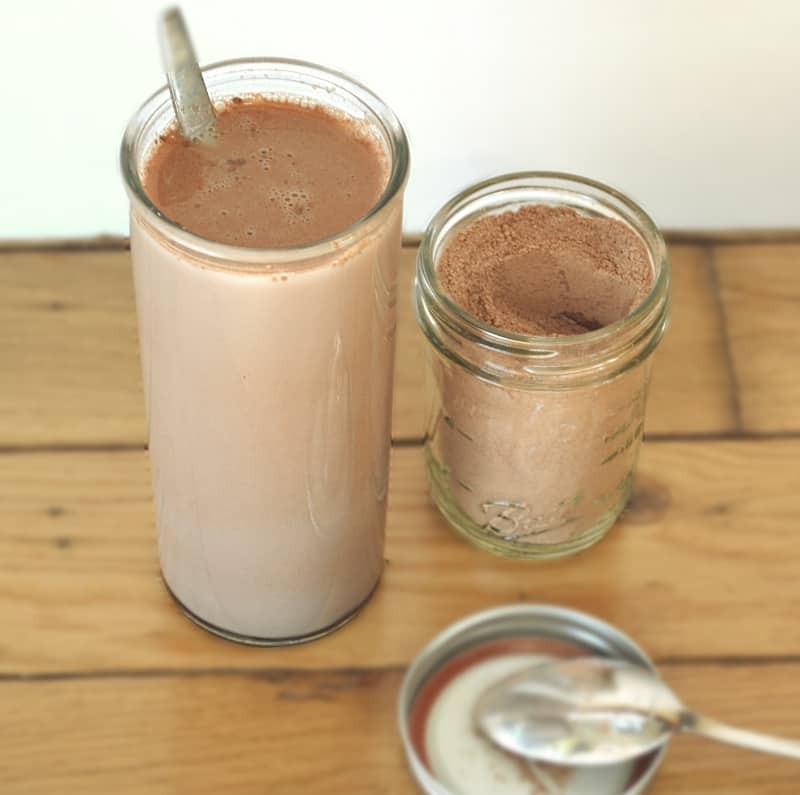 Plan on 1-2 tablespoons (to taste) chocolate milk mix to per 8 ounces of milk. When making a glass of chocolate milk, stir powder mix into 1 - 2 tablespoon warm water to help dissolve sugar crystals. Add milk, stir and enjoy. I made this today and let me tell you, it was delicious! Awesome! So glad you liked it! It will definitely always be in my house from now on – no more Nesquick! Did you use the same amount of Splenda (2/3 cup)? If using powdered sugar, am I right in assuming the amount would be the same? Just wanted to check before doing it. The sugar is not the problem, the Coco is. I tried it with both powdered sugar and granulated sugar and with both it had the foamy chocolate grit problem. Oh and to add to that, I tried both WITHOUT the dissolving trick before adding the milk. Just saying that powdered sugar did not resolve that issue for me. Do NOT use powdered sugar in this, unless you only want to make hot cocoa. The cornstarch in the powdered sugar will not dissolve in cold milk, and is hard to dissolve even when you when warm the milk. Stick to finely ground white sugar, baking sugar, for the best result. I will be using the cocoa and powdered sugar blend to make frosting for my next batch of brownies, LOL. Definitely not bad, but there is no measurement for how much cocoa to water ratio. I ended up with unsweet cocoa milk. But it’s not bad, and it’s the best chocolate milk mix recipe I’ve seen yet. And it’s so simple! I was in dire need of a glass chocolate milk and no Quik in the house. Found your recipe and am enjoying a nice glass of my favorite beverage. Thanks for sharing. I am actually disappointed with this. I was really looking forward to a nice cold glass of chocolate milk. But instead I was greeted with a cup of lies and sadness. Hmmmm…sorry to hear this. What weren’t you happy with? Don’t know what you did wrong. Mine is delicious! Thanks Amanda and yes, Goodbye Nesquick! Hahaha! A cup of lies and sadness? Don’t be so dramatic, she doesn’t work for the government. Amazing! I was almost certain this wouldn’t work because it was so basic, but I was wrong! Thank you! Just made it….awesome and son approved which is even better! Thank you so much! If I wanted to use Stevia, do you know what the amount would be? With all I am reading about sweeteners, natve I am better off using sugar. This is a dangerous recipe for me to have learned…it’s delicious! Chocolate milk is one of my absolute favorite drinks, a major indulgence that is usually stopped by the fact that I can’t afford to buy chocolate syrup all that often. Now that I can make it with just chocolate powder I’m in trouble! On the bright side, now maybe now I’ll drink more milk, it’s never too late, right? Worked like a charm! Perfect recipe to fix that chocolate craving. It’s good, but it’s no Ovaltine…. It’s not meant to be compared to ovaltine..that is a completely diff taste than even nesquick, which this is meant to be compared to. To each his/her own, I guess. To me this is DELICIOUS. Thank you. Enjoyed the results. I added about a scant tablespoon of Carnation Instant Breakfast mix to the overall recipe to impart a slight vanilla flavor. I would be careful of timing when using a food processor as it invites heat through friction heat and can melt the sugar and cocoa powder. For me, less than a minute was sufficient. Also, a small whisk is helpful with the blending with the warm water. Thank you for this recipe! It satisfied the big kid in me who wanted a glass of chocolate milk but didn’t want to drive to the grocery store for syrup or nesquick. I added just a pinch of cinnamon to the mixture and it really punched it up a bit! Winner! I knew it was easy but needed some ratios, so this was a big help. I threw in a small amount of vanilla extract, really just because I put it in everything. Then filled it with ice cubes to get my nice cold chocolate milk I was craving! Very tasty! I just mixed & then use a stick blender for every glass. No warm water needed & the result is a fluffy, yummy glass of chocolate milk! Perfecto!! I’m 8 weeks pregnant and needed a glass of chocolate milk so bad. All I had was dark chocolate cocoa powder but it worked wonderfully! Thank you for the recipe! Thank you so much, it cured my chocolate craving when I had nothing in my house! I can not say how happy I was to find this, and then freaking ecstatic when it turned out awesome! I NEED my coffee in the morning, but can’t stand it w/o enough flavoring not to taste it! Mixing this into my hot coffee and then adding about 8-10oz cold milk? PERFECTION. 🙂 The only thing I did do differently is substitute vanilla sugar for the regular stuff. Thank you so much! Can’t stop laughing at the “Cup of lies and sadness”comment. This is a great recipe which I’ve used frequently, even before I saw it here. I shared that comment in a recipe for chocolate syrup I recently made – just so readers could get an idea of how some people really feel about the powdered version. Lol. I used your recipe and then placed it into a liquid tight container, added some hot tap water, and then shook the heck out of it. Now I have a chocolate syrup that I keep in the ‘fridge. Ends the grit problem. I guess if you want to get fancy you could blend the mixture together in a blender or by use of a mixer before pouring it into the container. Great idea Roger! Glad you enjoyed it & love the innovation 🙂 Thanks for stopping by! I made a glass an its great! But for one glass i did 1 scoop of unsweetened coco powder an 1scoop of suhar 1cup mixed into 1cup of warm water an slowly pour an mixed into milk it was great thankyou for the recipe! Hi! After reading nesquik is not gmo free, I’m on a mission to make my own for my toddler! Thanks for this recipe. Which cocoa powder did you use? Hi Anuradha. I’ve used Hershey’s, Wilbur, King Arthurs & numerous other “gourmet” brands – basically whatever I have on hand. Take 1/2 c. cocoa powder, 1/2 c. water, 1/2 c. white sugar and put in saucer, heat for 3-5 mins on low, stirring constantly, until everything melts. Add 1/2 tsp. vanilla once melted. Take a large mason jar, and add 4 cups of cold milk. Then add the warm chocolate mixture. Put cover on mason jar and shake well. Refrigerate. You then have the best chocolate milk with no grit, ready in the fridge. I used powdered sugar. Mixed with milk in a blender bottle. Served in a glass chilled in the freezer. Absolute perfection! I am going to try this for sure! I found out nes’quik is made with GMOs so I have to get my chocolate milk fix another way. Thank you for the recipe and other tips in the comments!!! Tried to rate this a 5 star but only let me give 3 stars. EASE is the key for me. Simple 3 ingredients and I can make this Nestle Quick chocolate milk mix with quality ingredients!!! YUM! a Winner! Just made this and my husband loved it! Ran out of chocolate powder for my daughters nap time cuppy,found this and decided to give it ago.She is happily drinking her milk right now,so I’d say it was a big hit in this house.Thank you. I tried using powdered milk instead and it didn’t mix too well. I think I’ll just add warm water to it and that should help. If you add warm milk it makes a great Hot Cocoa too!! I tried giving this 5 stars but it wouldn’t let me. I’ve always added warm water to my chocolate milk powder mix (normally I used hot cocoa mix). My Meemaw alsways made it that way. I’m going to make this tonight, because I’m craving chocolare milk! Don’t know if anyone mentioned this, but if you put the cocoa mix + water in the microwave for ~30 seconds, it creates a perfect chocolate milk base! Thanks for sharing your recipe! I haven’t tried this but I have been experimenting with my own recipe. I heat 1/4 of the milk then add cacao, sugar, salt and cornstarch. I return it to the heat and whisk it for about five minutes, allowing the mixture to thicken. Then I add in the rest of the milk (which helps to cool it down) and add a tiny splash of vanilla and xanthan gum. I mix it thoroughly and put it in the fridge for a few hours. What I end up with is a somewhat thick, creamy, chocolatey, chocolate milk. It is much better than anything you can get at the store. FYI… the type of cocoa you use will make a difference. Look for alkalized cocoa; that dissolves better in liquids. Also, the powdered sugar shouldn’t be 1:1, as it’s sweeter than regular sugar. It also contains cornstarch, which could change the flavor a bit. This just saved me! I am making massive amounts of hot chocolate mix for gifts and only had 1/2 of the chocolate milk mix (store bought) that I needed. Whipped this up to make up the difference and it just saved me a trip back to the grocery store!! Thanks! This is absolutely AWESOME! Rather than dirtying my blender to mix the cocoa and sugar, I simply put it in a sealed tupperware type of container and shook it up. Worked great with no mess. I have to say this is a wonderful recipe and will permanently replace Nesquick for me. I also found the amount needed in my milk is greatly reduced. Using less than 2/3 of what I would ordinarily use gave me the chocolate taste I am so in love with. Thanks for the recipe! THANKS SO MUCH!!! I thought I was going to have to give up my coffee. I have always added powdered chocolate milk mix to my coffee for flavor. I don’t want anything with milk or creamer. For me Nesquik and other Nestle mixes are way too sweet. Over years they have been discontinuing other brands, even store brands. The only brand that has been available in the stores or online has just been discontinued. This is just what I was looking for! Thanks again. I tried this when we had quiet a bit of milk that was close to expiring and using a little hot water to make it a liquid and adding some vanilla made it a huge hit with my whole family! I even told my sister in law about for her kids. Adding a dash of cinnamon was amazing! Yum! I made it exactly as posted. I like the leftover crunchy bits myself. I’ll never buy the storemade again. Thanks!